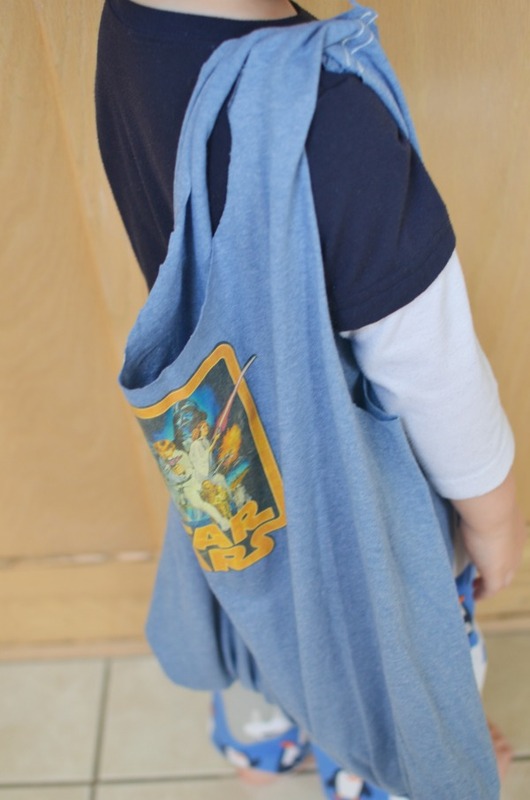 This easy no-sew project makes the perfect book bag or grocery sack. 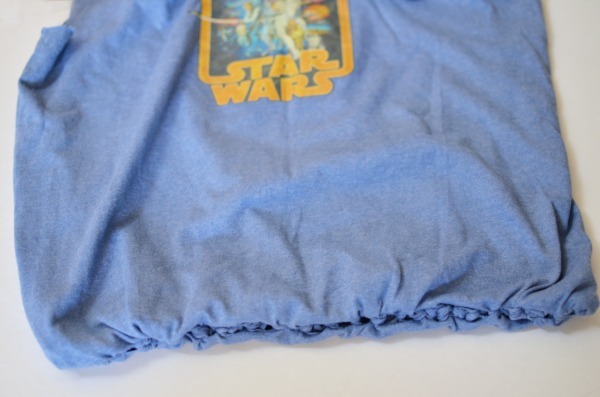 Upcycle an old shirt into a useful t-shirt bag in just a few steps. 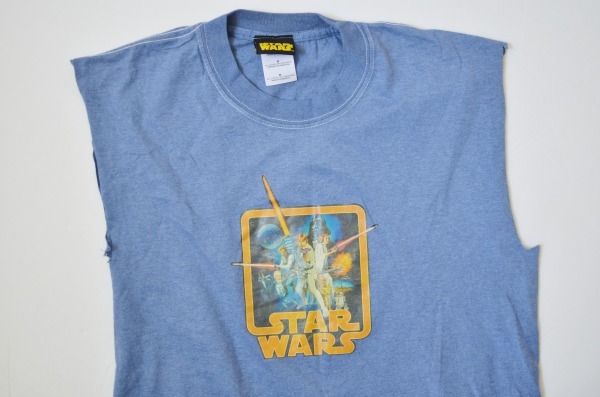 We’ve had this awesome Star Wars shirt for years, but it shrunk down after the first wash. I’m not the best at getting rid of anything, so I had held onto it. We spend a lot of time at the library and the boys enjoy hauling their own books back and forth. I decided to use this never worn shirt and upcycle it into a no-sew t-shirt bag. 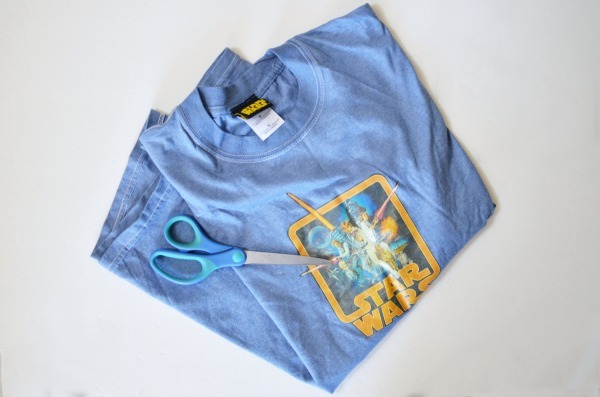 All you need is a few minutes, a t-shirt that needs new life breathed into it, and some scissors. 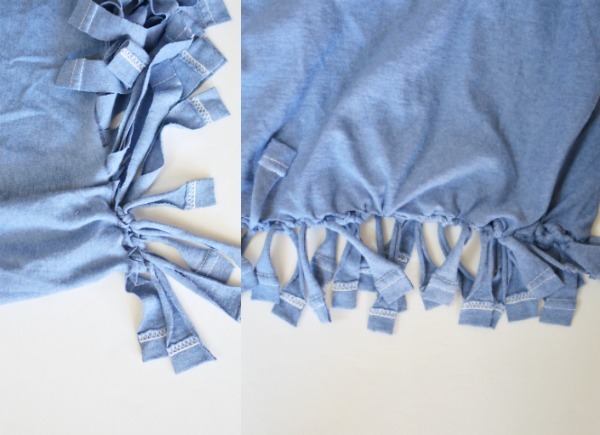 No sewing skills required for this easy project. in fact once you’ve got the slit cut it’s a great project for the kids to help with. If they can double not they can make this bag. Using a medium bowl trace and cut out a half circle from the neckline. Turn you bag inside out. Using a straight edge mark a line 5 inches from the bottom hem. Cut slits up to the line every inch. Knot the first two slits together. Continue down the row knotting pairs together. The next step will close the gap between each knot. Starting at the beginning again, take the right strand from the first knot and the left knot from the second knot, and tie together. Double knot to make it extra secure. 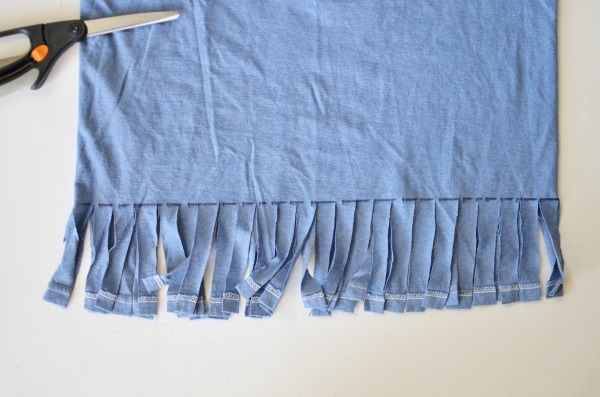 Continue tying pairs of slits together until you reach the end. Flip the bag right side out. Super simple, right? What’s even better is it’s completely washer safe. 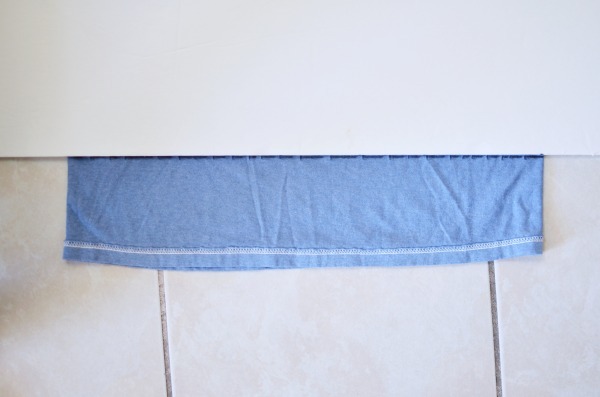 Whether it’s dusty from carrying books or a bit dirty from carrying fresh veggies you can toss it right in with the rest of the wash.
Checkout these other no-sew projects. Easy crafts that can be done in under 30 minutes.